Scarcity of studies on historiography of medieval Eastern Turkestan and the resulting lack of reliable narrative sources have always impeded the work of students of the region’s history, particularly history of the sixteenth and seventeenth centuries, as vividly demonstrated by the writings of Ch. Valikhanov, V. Grigoriev, R. Shaw, N. Elias, M. Hartmann and others. M. Hartmann, proceeding from source studies by V. Barthold was more successful than his forerunners in elucidating events in Eastern Turkestan of the time, but still the sources he used leave unanswered many questions concerning the chronology of Chaghatai rulers of the state with the centres either in Yarkand and Kashghar or Chalysh and Turfan; the records often keep silence about the order of occurrents of events in the state, about the country’s relations, ties and contacts with neighbouring nations, etc. This gap in our knowledge is largely bridged by the work of a local his-toriographer Shah-Mahmud b. mirza Fazil Churas, retainer of the Chaghatai khans, follower of the Ishaqiya (Qarataghlyq, i.e. Black Mountain) khwadjas. The annalist gave no title to his work, but in modern scholarly circles it came to be known as Ta’rikh-i mirza Shah-Mahmud-i Churas through publications of Z. Togan and A. Semenov later used by C.A. Storey. Here we call it “Chronicle”. “The Chronicle” is a history of consecutive Eastern Turkestan rulers from 1428 to the mid-seventies of the seventeenth century, written by the order of Erke-bek, Oirat Qalmaq protege and henchman, whose biography the chronicler places on f. 83a-b, and dedicated it to Chaghataid Isma‘il-khan (1670—1682). The work consists of 119 chapters, or stories (dhikr, guftar, rarely qissa) the first fifty-six of them being a paraphrase of seventy-seven chapters of Ta’rikh-i Rashidi by mirza Haidar (34 and 43 chapters from the first and second books respectively). The fact that the first half of “The Chronicle” (ff. 3a to 46b) is entirely based on Ta’rikh-i Rashidi, practically presenting a patchwork of the earlier source’s material, greatly affected the structure of the history as a whole. The non-derivative part of “The Chronicle” (ff. 46b to 85a) proves that Shah-Mahmud used no written sources whatsoever for it, obtaining his in formation mainly from stories of witnesses to and participants of the events, memories of kinsmen and his personal observations. He also drew extensively upon an oral tradition of his environment from his childhood (very likely, ancestral legends or an oral history of the clan). In fact, a certain likeness of reports in “The Chronicle” and in Mahmud b. Wali’s Bahr al-Asrar (completed in Balkh circa 1050 H. /1640-41) is accounted for solely by both historiographers using verbal information that came from the same milieu of the military nomadic nobility of the Churas clan. The last date cited in the work is the eleventh of dhu-l-qa‘dah 1080 H. (April 2nd, 1670). The manner, contants and structure of “The Chronicle” incon-testably place it most close to other local dynastic histories with their basic emphasis upon foreign relations and their composition strictly following the reigns of consecutive dynasts. Three main objectives of the original part of Shah-Mahmud’s work appear to have been: a) writing a history of rulers of the state in Eastern Turkestan, centering upon Yarkand and Kashghar, which he calls “mamlakat-i Moghuliya”, i.e. Moghulian state (kingdom), or Moghulia; b) extolling the role of his Churas clansmen in the country’s life, and c) demonstrating the influence of the Qarataghlyq khwadjas in domestic affairs of the state. Being a sequel to Ta’rikh-i Rashidi “The Chronicle” substantially furthers our knowledge of events in the region from the mid-sixteenth century to the 1670-s. Shah-Mahmud’s narratives abound in important evidence, they are rich in detail, vivid descriptions and interesting new facts. Within certain limits they enable the modern historian to reconstruct the situation in the Moghulian state on the eve of the Oirat (Qalmaq) conquest around 1682. The chronicle’s contribution is made even more important by the fact that much of its evidence came from eyewitness observations of our annalist who took active part in many events he describes. Data relative to the Chaghataids’ Eastern Turkestan possessions centred upon Chalysh and Turfan are likewise of consequence, scarce and scattered as they are. The Chronicle’s material is certain to bring corrections into reference books on the Moslem chronology and genealogy, in particular, into the Chaghataid section of the most recent one by С. E. Bosworth. Though failing to become a complete history of the Churas clan, Shah-Mahmud’s work gives much place to the author’s clansmen, who reappear permanently on its pages starting from 1428 when Churas beks and amirs first came to the forefront in the state. No other known source contains as abundant and as detailed information concerning the Qarataghlyq (Black Mountain) khwadjas as that collected and narrated by the chronicler in many stories of his work. “The Chronicle” records gradual emergence of the khwadjas as a major political factor in the state, a force respected and feared by both the military nomadic nobility and the landed feudal lords. As demonstrated by the author, the khwadjas’ influence on the secular authority, represented by the khan, and on the state machine, often proved to be overwhelming. In a word, we see the khwadjas, originally a religious sect, evolve into secular feudal lords. Unfortunately, this valuable source loses some of its significance by saying nothing about the Aqtaghlyq (White Mountain) khwadjas, political rivals of the Black Mountain sect, whose fierce struggle with the opponent khwadja party had a profound effect upon the destiny of the state and the dynasty. The reliable and highly important material already mentioned by no means exhausts merits of “The Chronicle” as an historic source. Shah-Mahmud brings new word about neighbour peoples of the Moghulian state opening another page in the history of the Ouzbek, Qazakh, Qirqiz and Oirat and their mutual relationship. His work is the first to report in much detail the campaign, disastrous for the Ouzbek, opened by Sheibanid Abdallah II at the close of his reign (apparently in 1003 H./1594). Shah-Mahmud is the only annalist who wrote an account about the revolt of Andi-djan citizens in 1048 H. /1638 when the city’s population rose against the soldiers of Imam-Kuli-khan forcing them finally to raise the siege of the city and retreat. Shah-Mahmud brings to notice the important role played by Qazakh sultans and their troops in the long varyingly successful struggle of the central authorities in Yarkand with rebellious rulers of Eastern Moghulia, with the seats in Chalysh and Turfan. He tells us about unions formed by various Moghulian rulers now with Qazakh khans and now with pretender Qazakh sultans. Much space in “The Chronicle” is devoted to Qirqiz tribes and clans, their representatives being mentioned by Shah-Mahmud more and more often as his story unfolds, which seems to be collateral evidence of their growing role in the domestic life of the Moghulian state. Indeed, Abd ar-Rashid-khan and his son and heir Abd al-Karim-khan succeeded in inflicting a number of defeats on united armies of the Qazakh and Qirqiz pushing the latter into Central Moghulistan and temporarily making the country’s frontiers safe. However, the tide turned in the reign of their successors, and by the opening of the seventeenth century the Qirqiz not only settled at the northern and north-western borders of the Moghulian state, but became a cause of special annoyance with vicegerents in Kashghar, Uch and Aqsu, which areas they penetrated, driven by the growing pressure of the Oirat (Qalmaq) and settled taking advantage of the obvious weakening of the khan’s power. The Qirqiz settlement was of particular import since it was followed by their migrations en masse within the state. At first Yarkand rulers sought to keep the movement in check, but unable to control it they decided to use the Qirqiz tribes as a force capable of strengthening the khans’ authority in their fight the powerful military nomadic nobility. Thus Qirqiz tribal detachments made their appearance throughout the khans’ troops, while Qirqiz feudal lords came to occupy a prominent place at the court in the second half of the sev-enteenth century under Abdallah-khan. By the end of his reign numerous administrative posts and offices both in the capital and the province were held by Qirqizes and Qirqiz units constituted the bulk of the khan’s military force. This, however, did not prevent the khan from two attempts to exterminate some Qirqiz tribes. To cite just an example, by the order of Abdallah-khan, about 10.000 Bulghachi tribesmen were massacred. Of no small importance is “The Chronicle”s evidence for the historian of the Qalmaq (Oirat) and their expanding pressure on Eastern Turkestan from the 1640s onwards. It is common knowledge that the Qalmaq penetration of the region/which ended in its complete subjugation, and its routes remain practically uninvestigated, since both Central Asiatic sources of the seventeenth and eighteenth centuries and local historiographic writings gave little attention to the Qalmaq progress and contain surprisingly few data about the people. The only exception so far known is the present work, whose value is greatly enhanced by its being a firsthand report of an eyewitness to the conquest. Reading “The Chronicle” we observe episodic raids of the Qalmaq to change, as the strength and power of the Djunghar khanate grew, into regular and insistent interference with domestic affairs of the Moghulian state. Finally, with further internal dissension and strife resulting in disintegration of the state, the Qalmaq interference made it lose the last vestiges of independence. 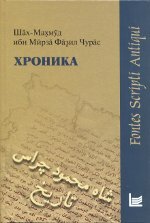 The edition contains a publication of the original part of “The Chronicle” by Shah-Mahmud b. mirza Fazil Churas, accompanied by its Russian trans-lation with detailed-commentary, and a study by O. F. Akimushkin on the author, his work and history of Eastern Turkestan from the 1640-s to the 1670s. The book is provided with a number of indexes.